Bees adore rosemary, the powerfully resinous Mediterranean native known both as a groundcover spilling over garden slopes and as an accent or tall hedge plant. Cooks love the herb for seasoning poultry, lamb and breads. Cosmetics companies use its essential oils in skin and hair care products. Medical researchers are exploring carnosic acid -- derived from rosemary leaves – because, among a number of possibilities, it shows promise as an antioxidant. But this last property isn’t a surprise considering the plant’s long history as a stock item in folk medicine. Nevertheless, what may surprise some gardeners is that despite the needle shape of rosemary’s leaves – so different from the broadleaf foliage of most true sages – botanical researchers now suggest moving it to the Salvia genus. 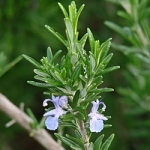 This is the reason why you’ll now find rosemary listed among the Salvias of the Flowers by the Sea online nursery catalog. Despite its introduction to horticulture long ago, rosemary faced uncertainty about its mint-family ancestry until last year when DNA analysis showed the tiny genus Rosmarinus to be more appropriately placed in the huge Salvia genus of about 1,000 species. Plant taxonomists have periodically suggested breaking the varied Salvia genus into smaller groups based on questions about ancestors. However, a team of researchers from the U.S., Mexico and Asia opposed that argument in the February 2017 issue of Taxon with their study Salvia United: The Greatest Good for the Greatest Number. The research team, led by University of Nebraska biologist Bryan T. Drew, suggested reclassifying five small mint-family (Laminaceae) genera as kinds of Salvia. They included the genus Rosmarinus, which has five verified speciesof which the most widespread is Rosmarinus officinalis. Some growers, including FBTS, now call it Salvia Rosmarinus. The more types of Salvia the merrier is what we think at Flowers by the Sea. But that’s only part of our reasoning for adding two varieties of rosemary to our catalog. Both are excellent hedge or accent plants for full sun in USDA Plant Hardiness Zones 8 to 11. They tolerate heat and drought. We grow Salvia rosmarinus ‘Gorizia’, which blooms summer to fall and is native to the border lands between Northern Italy and Slovenia. It reaches up to 5 feet tall and 6 feet wide, but also works well as a container plant where you can expect smaller growth. Salvia rosmarinus ‘Frank Krozek’ is a larger rosemary growing 6 feet or more tall and wide. It blooms spring to fall. Frank was the grandfather of FBTS co-owner Kermit Carter. This shrub is part of Carter family history; it’s reproduced from a clone that has been in the family since the 1930s. 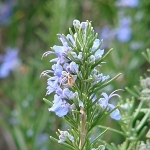 Long revered for its flavor, fragrance and folk-medicine uses, rosemary was one of the first herbs humankind recorded in writing. The Mesopotamians documented its existence by writing in cuneiform on clay tablets. Nearly 600 years later in 76 A.D., Pliny the Elder (died 79 AD) wrote about medicinal plants in his Naturalis Historia where he recorded 18 uses for rosemary ranging from controlling convulsions to healing wounds. He described it as smelling like frankincense. The Ancient Romans are credited with spreading the herb to Europe. The common name rosemary is based on the Latin “rosa” for dew and “marinus” for sea – so, “dew of the sea.” It’s an appropriate choice, because rosemary grows so well in coastal areas. In the 1700s, Swedish botanist Carolus Linnaeus (1707-1778) invented binomial nomenclature, which gives every plant a unique two-part name based on genus and species. In his 1753 book Species Plantarum, Linnaeus published the name Rosmarinus officinalis. He based the species portion of the name on the herb being a standard item in ancient apothecaries called oficinas. Tropicos, the worldwide plant database of the Missouri Botanical Garden, notes that nearly a century later, renaming occurred. In 1852, German botanist Matthias Jacob Schleiden authored the plant as Salvia Rosmarinus in his Handbuch der Medicinisch-Pharmaceutischen Botanik. Obviously, the 19th century name didn’t stick. However, maybe it will now due to the DNA analysis detailed in the "Salvia United" study. Would you like more information about rosemary and other Salvias grown on our family farm? We’re always glad to share what we know and brainstorm gardening ideas with you. Please contact us today for sage solutions.